Another charming photo of my mother-in-law. 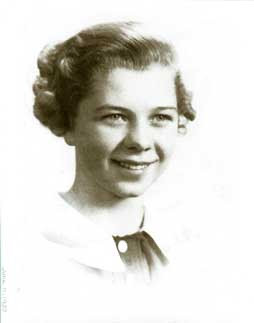 She's 17 years old in this picture taken in 1937. 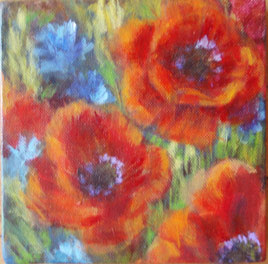 I haven't blogged regularly of late because of her recent death. So many things to be done. Many pictures are turning up that we haven't seen before. I'm organizing and archiving them and printing some for family members. The process of looking back at a life well lived is a privilege and deepens my wondering about God and the way our lives are put together. What a mystery our lives are! This charming little photo was found in Fred's mother's effects. 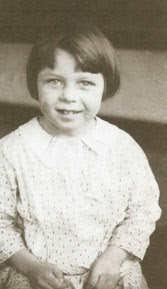 We think it was probably taken when she was five or six in 1925 or 26. What a glimpse back in time! She had that sweet charming nature even then! Sitting in HOT Grand Rapids, longing for Portage Lake! 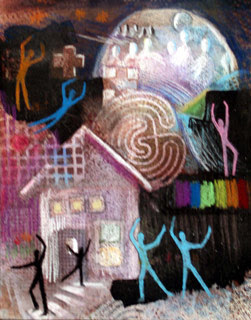 Sanctuary #3 was purchased yesterday and is on its way to Canada. I was honored to meet Sylvia Keesmaat and her mother Irene Keesmaat who were in Grand Rapids to attend the Synod of the Christian Reformed Church. Sylvia included some of my work in a devotional booklet she edited for use with meditations about the use of the gifts of women in the church. 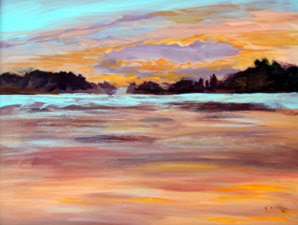 Irene is also an artist and lives and works in Caledonia, Ontario. It was a delight to visit with them. My mother-in-law died this weekend after a long illness. As I was talking to someone today at church, I was remembering how she was so terrified to go to the doctor or the hospital but then afterwards she would invariably say "Everybody here is so nice!" I imagine her now, all 4'3" inches of her amongst the saints and angels, saying "Everybody here is so nice!" I like that image a lot! Thought you'd enjoy a chuckle along with us as we celebrate the life of that sweet woman who was niceness personified. 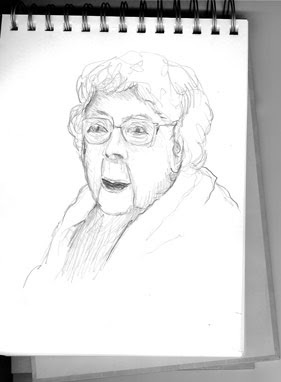 This is a sketch I did of her in the care center a few months ago. 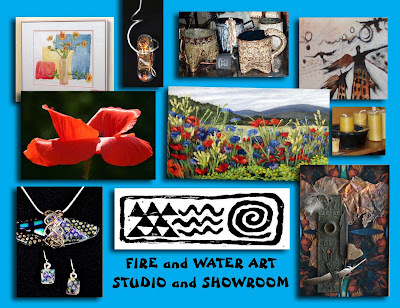 Obviously, I've been spending quite a bit of time with graphic design for the Fire and Water Showroom! 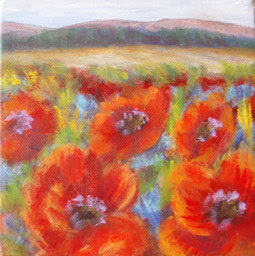 Actually, I have done a few small pieces of my own art but none photo worthy as yet. GREAT quote! Don't know who he was, but that is some serious wisdom! 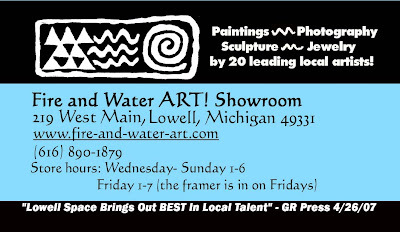 This is a standard size postcard I did for the Fire and Water ART Showroom. I find this a really fun process. Maybe because I'm so excited about the place!